Warm liquids, and liquids with low SG low cP ARE compressible. 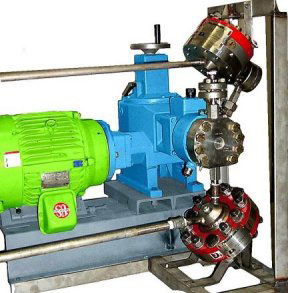 The liquid in the pump has to expand down from system discharge pressure, as does the diaphragm drive fluid, until both have reached near atmospheric pressure; before the suction check valve can even begin to open. The expansion process uses up to 40% of suction stroke before the pump can start to fill. In the lost time the pump plunger has accelerated to near 3 times its average speed. Therefore when the check valves does open, the suction system has to jump from zero velocity up to three times the mean velocity. This is called "Velocity Jump from low volumetric efficiency". So low volumetric efficiency cases a massive & instant pressure fall. The fall makes negative pressure waves, or negative shock. A negative pressure wave - shock - travels back up the supply system - at about 3000 miles per hour, and breaks the liquid column into slugs of liquid spaced with air and gas pockets. Now the supply line feeds the pump intermittently, liquid gas liquid gas, bubbles, "slush". The pump efficiency falls still further and has no chance to maintain any metering accuracy. Dampers shocks can not bypass - the FLEXORBER range FLO, & FL-LP for suction REMARKABLE low cost RESULTS. 1). Immediate return tot eh pump vendors 1% metering accuracy and often better. 2). Higher flow rates. The pump can now run 50% faster & transfer far more liquid. 3). 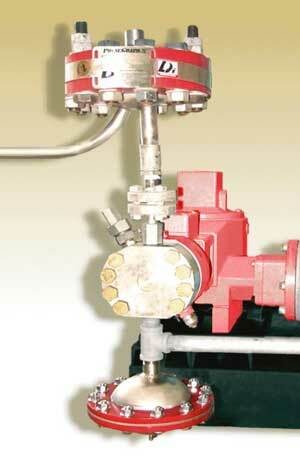 Instruments and control systems function, and the pipe system stops fracturing. Direct supply. Unfiltered information, the right data, save 80% markup. Open communication. Dampers that do, flow goes through, Pressure pulses do not.